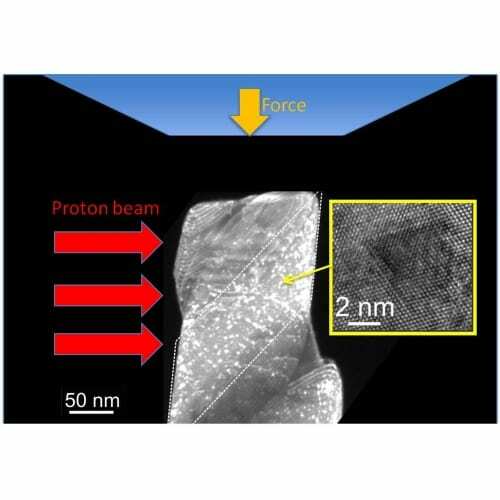 A team of material scientists developed a new method to obtain mechanical properties and deformation mechanisms from nanosized irradiated samples. The results of this work were published in a paper entitled ‘In situ nanocompression testing of irradiated copper’ by D. Kiener, P. Hosemann, S.A. Maloy, and A.M. Minor in the journal Nature Materials. Dr. Daniel Kiener, lead author of the paper, gives us his view on the research. As the recent events in Fukushima tragically demonstrated, the safety of nuclear power plants needs further improvement all over the world. This can be achieved by ‘stress-tests’ or, in a preventive manner, by developing better materials. Both approaches are possible, but in practical experience timely and cost intensive. Further, it should be considered that a shutdown of all reactors would significantly complicate the support of radioisotopes for medical applications and related research in these fields. 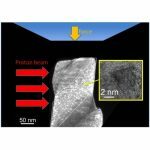 As an alternative to classical materials testing, our team of international experts from the University of California, Berkeley, the Berkeley National Laboratory, and the Los Alamos National Laboratory developed a new method to substantially improve testing of materials intended for use in a radiation environment. We irradiated the model material copper with protons. This high-energetic irradiation created defects in the material similar to what is observed after exposure in nuclear reactors. We were able to show that we can determine macroscopic properties of this material using samples having a diameter of only 400 nm. This miniaturization bears a number of benefits. As in the present case, the samples can be irradiated with protons instead of neutrons. This avoids the risk of material activation (radioactivity) as would be the case when using neutrons. Moreover, the specimens are so small they become transparent to electrons. Thus, the whole testing can be performed in a transmission electron microscope, allowing observation of plasticity on an atomistic level. Besides measuring the mechanical properties, we deduce the mechanisms governing strength and plastic flow at the same time, for no extra effort. In the current case, deformation was limited to few atomic layers. Such mechanistic understanding is important for future material design. Finally, as the radiation dose scales with the sample volume, microscopic samples are easier to handle.